Protects your wheels and tires and makes for easy clean up! Use our Heavy Duty Canvas Wheel Maskers to keep your wheels and tires clean while you compound, polish and wax your vehicle! 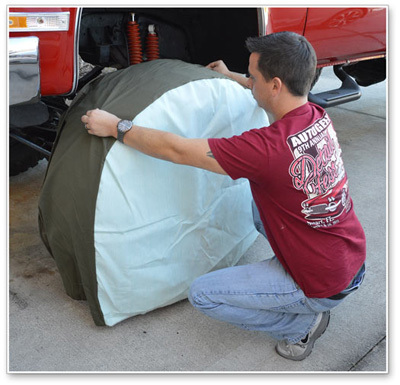 Designed to fit wheels ranging from 20 to 28 inches in diameter, Heavy Duty Canvas Wheel Maskers ensure complete tire and wheel protection from compound splatter, accidental spills, and more! Each wheel masker features a wire reinforcement that quickly locks the wheel masker into place. Heavy Duty Canvas Wheel Maskers are washable and reusable. Heavy Duty Canvas Wheel Maskers will quickly become one of your favorite detailing accessories because they save you time AND money! Wheel Maskers save you time by protecting your wheels and tires from compound and polish splatter. With a polisher rotating at several thousand RPM, compound splatter can be impacted into the tire, creating a mess that’s difficult and time consuming to clean up. Trust us when we say that scrubbing your tires with a tooth brush is the last thing you want to be doing after spending all day detailing your vehicle! Heavy Duty Canvas Wheel Maskers save you money by reducing the time spent detailing the vehicle. If you detail for money, then you’re well aware the sooner you can kick the car out the door and get another one in your shop, the more money you make. Busy detail shops live by the saying “time is money” and Heavy Duty Canvas Wheel Maskers will definitely save you time. If you’re a professional detailer, set yourself apart from the competition by going the extra mile to protect your client’s vehicle. Our Heavy Duty Canvas Wheel Maskers look great, and will make it clear to your client and bystanders that you go above-and-beyond with every vehicle that you detail. This is called visual marketing, and it provides one more way to promote your business. Heavy Duty Canvas Wheel Maskers fit wheels ranging from 20 to 28 inches in diameter, with a total max tire diameter of 40 inches.